You can't judge a book by only its cover - which is why we made sure Cocina Superior is stunning both inside and out! From the crisp white stucco and sleek glazed glass exterior to the rich leather booths and mahogany bar on the inside, Cocina Superior is the most stylish spot in town. Check out the images below to see the vision behind Cocina Superior. 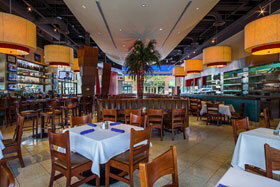 Cocina Superior was designed by Mark Knauer, of Knauer Inc. in Chicago, Illinois. Cocina Superior is Modern Tex Mex. Its old Mexico and contemporary America- in the kitchen, at the bar and on your plate! It’s all your Tex Mex favorites, innovative original dishes that we know you’ll come to love and an impressive selection of unique cocktails all served in a stylish setting, filled with sleek design, vibrant color and music to match. The restaurant can be enjoyed for lunch or dinner, indoors or out, year round, thanks to a large heated and air conditioned patio. The full service bar features an extensive array of Mexican and domestic beers, an impressive wine list, and a menu of house drinks that promises to satisfy. 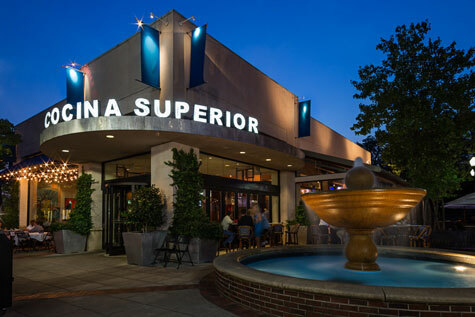 With an outdoor fountain side lounge and a unique glass walled bar, Cocina Superior is the place to enjoy the latest cocktail or have a beer with friends. From warm woods and leathers to sleek stainless steel and glazed glass, the mix of natural and contemporary elements create a crisp yet inviting design that is unlike anything Birmingham has ever seen. Cocina Superior is perfect for lunch with coworkers, happy hour after a long day, having a relaxing dinner with friends or ending an extraordinary night. Cocina Superior gift cards are the perfect gift for the people in your life who love to have a good time, enjoying great food and drinks in a festive yet chic atmosphere. Cocina Superior gift cards are available in any denomination only at the restaurant, so the next time you visit us pick up a few for the people you’d like to reward, thank, or treat to a special night on the town! Our gift cards are only redeemable at Cocina Superior and expire one year after the purchase date. Cocina Superior gift cards are not redeemable for cash.